A cat entering the frame at the moment of shooting, an overlooked detail, a shadow or spot in the wrong place, something unexpectedly breaking the harmony of the composition: they’re all examples of how even to the greatest professionals can now and then end up with a few unsatisfying photos. TouchRetouch by Adva-Soft for the iPhone provides users with a set of tools to remove undesired objects and details from photos. Sometimes it doesn’t take much to save a regretful photo from damnation, with the right instruments. Share on Facebook, Twitter, Picasa, Flickr. Let’s imagine I have a photo I like of my friend’s amazing fish tank, but for some reason there is one fish that materialized in the bottom corner at the last second that annoys the hell out of me. I don’t know why, I just don’t want that stupid fish to be there. Why don’t I take another photo? Maybe I just can’t, for a reason or another. Do I have to keep the photo as it is? Seems like it, but I don’t really like the idea. Then what can I do? First of all, I load into the workspace the fish tank photo. I have a few options to fix the problem. I can use the brush tool to paint a mask over the less than desired object I intend on removing. 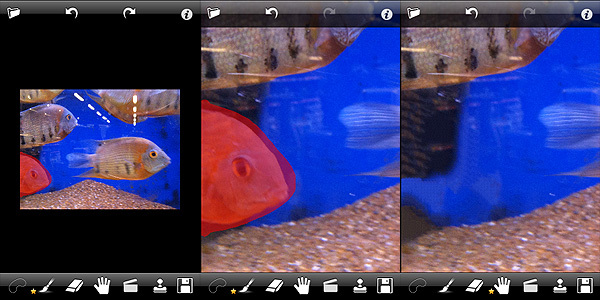 By moving the photo around with the hand tool and by pinching to zoom in and out, I can do it quickly and easily. If I make mistakes, I can undo as many times as I need or I can adjust the masked area using the eraser tool. Another method to create the mask and achieve the same result is by using the lasso. Finally, there is the clone stamp tool, which allows sampling pixels to paint over a given area. I can set the clone stamp size, opacity and direction for better results. The clone stamp is particularly useful with patterned surfaces, like walls or paving, for example. In the specific case, I said I used a photo I had taken previously, but I could have also taken a photo with the built-in camera. In both cases, the process is exactly the same. TouchRetouch is one of these must-have apps that you will inevitably find yourself using, eventually. Adva-Soft’s app will definitely add value to your collection. If you want to see how the app works before buying, why not getting TouchRetouch Free? Compatibility: iPhone, iPod Touch, iPad. iOS 3.1 or later. I don’t know what I’d do sometimes without Touch Retouch! Will check this out, thanks!